Today we headed to the northern part of Yellowstone. One thing we noticed was that the fire damage that we witnessed in 1992 had really given life to new forests. That year we noticed how badly the park was burned from the 1988 fire, the largest wildfire in the recorded history of Yellowstone National Park. A total of 793,880 acres, or 36 percent of the park, was affected by the wildfires. However, today Yellowstone’s new growth was beginning to overtake the burned forests. What a difference 10 years makes! We travelled up to Mammoth Hot Springs, not far from the Montana state line. 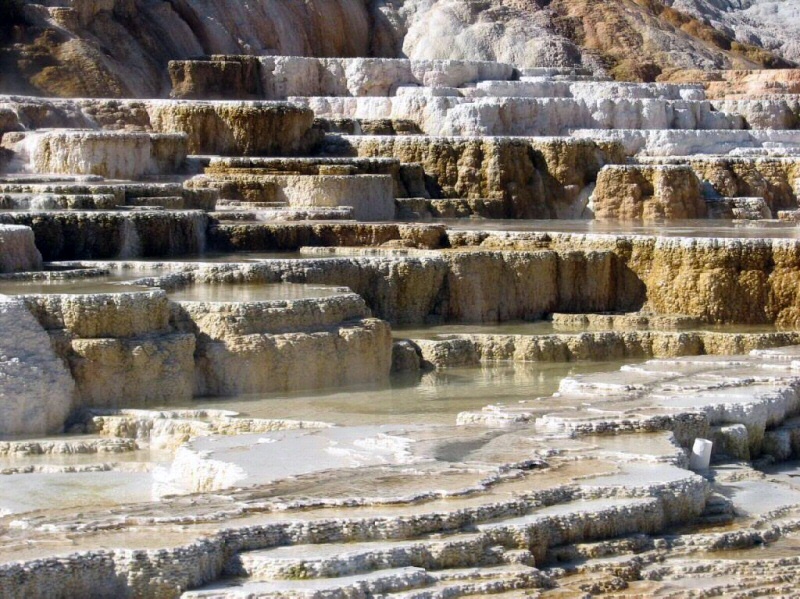 Mammoth Hot Springs, adjacent to Fort Yellowstone, is a complex of hot springs created during thousands of years as hot water from the spring cooled and deposited calcium carbonate. Hot water feeding Mammoth travels underground via a fault line than runs through limestone coming from the Norris Geyser Basin. The limestone creates the calcium carbonate forming the springs. Just north into Montana on the 45th parallel – halfway between the Equator and North Pole – Dad, Jeff and I hiked the short Boiling River Trail to one of America’s most interesting swimming holes. The Gardner River mixes with Yellowstone’s hydrothermal features to create a bizarre hot and cold soaking. 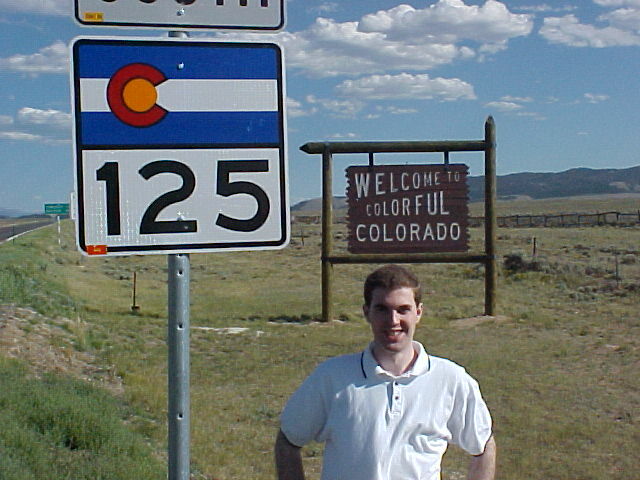 Not long afterwards we had to begin our long drive back to Denver. We stopped to view an exhibit on wolves as we left. Controversially, the NPS reintroduced wolves in 1995. Now more than 300 of their descendents live in Greater Yellowstone, but ranchers are not too happy. The exhibit explained both sides. After stopping a few times to say goodbye to the Tetons, we drove across the endless Wyoming plains and stopped in Cheyenne, before heading back to Colorado. That evening, we checked into the Marriott downtown. We then decided to drive to the Casa Bonita Mexican Restaurant in Lakewood, a place Jeff found in a book. The restaurant was more of an entertainment destination with strolling mariachis, flame jugglers, a small puppet theater, a haunted tunnel, an arcade and a magic theater. Most impressive was 30-foot waterfall, designed to resemble Acapulco’s cliffs, with cliff divers diving down to a 14-foot-deep pool! The restaurant seated more than 1,000 people!